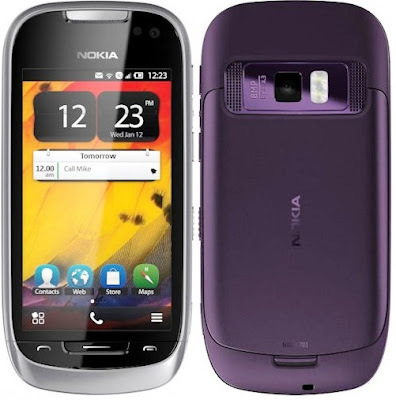 Nokia 701 features 3.5-inch IPS LCD touchscreen Scratch resistant Corning Gorilla Glass display with ClearBlack technology and has 640x 360pixel resolution. It is powered powered by 1GHz processor and 512MB RAM with Dedicated Graphics for 2D/3D acceleration. 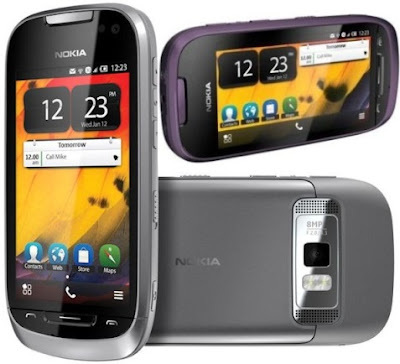 It runs on Symbian Belle OS and has 8GB of storage which can be further expanded up-to 32GB. It sports 8 megapixel full focus rear camera with dual-LED flash and a front facing VGA camera. Connectivity options of 701 includes pentaband 3G(download @14.4Mbps, upload @5.76 Mbps), WLAN 802.11 b/g, Bluetooth 3.0, GPS with A-GPS support, NFC. Expansion options includes Micro SD Card slot, microUSB, 3.5mm audio jack. Sensors includes magnetometer, accelerometer, proximity and ambient light sensors. This new Symbian Belle OS includes a task switcher, the ability to quickly move between applications or close them down plus it will also have the Android-style drop down notifications. Color options includes 4 types steel dark, silver light, amethyst violet and white.Other options includes Stereo FM Radio, active noise cancellation in calls. It has a dimension of 56.8×117.3×11 mm and weighs 131 gm/4.62oz. It comes with standard 1200mAh Li-Ion battery which provides talktime of 17hrs @2G, 8.8hrs @3G and has standby of 550hrs. Nokia 701 will be available from Q3 of 2011, with the price tag of €290 ($420) for unlocked version. Tags:Nokia 701, Nokia 701 features, Nokia 701 specifications, Nokia 701 review, Nokia 701 details, Nokia 701 availability, Nokia 701 specs, Nokia 701 images, Nokia 701 pics, Nokia 701 pictures, Nokia 701 imgs, smartphones, Symbian Belle OS smartphones, Nokia 701 Network options, Nokia 701 Expansion options, Nokia 701 multimedia features, Nokia 701 Sensor options, Nokia 701 price, Nokia 701 cost.